DAYTONA BEACH, Fla. (Feb. 6, 2019) – International Speedway Corporation (ISC) announced today a multi-year, multi-unit partnership with MoneyLion, America‘s most powerful financial membership. Beginning at Talladega Superspeedway on April 27, MoneyLion will have presence at six ISC motorsports entertainment facilities across seven event weekends throughout the 2019 race season, with the goal of bringing fans closer to the sport they love. In 2019, MoneyLion will offer fans unparalleled access to the sport by providing MoneyLion members 5% cash back on up to $2,000 in annual purchases of NASCAR tickets from authorized ticket sellers, at-track purchases from official vendors and all purchases at NASCAR.com. 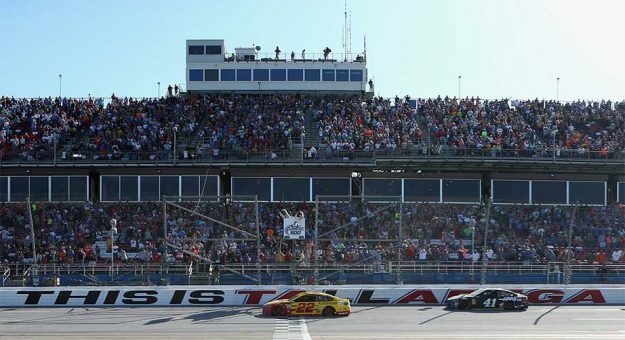 The most significant element of the ISC-MoneyLion partnership is MoneyLion’s recently announced entitlement sponsorship creating the MoneyLion 300 at Talladega Superspeedway during the track’s 50th Anniversary. Building off MoneyLion’s alliance with Team Penske in the NASCAR Xfinity Series and Monster Energy NASCAR Cup Series, MoneyLion will deliver unique fan experiences at the midway at ISC racetracks including Darlington Raceway, Homestead-Miami Speedway, Michigan International Speedway, Kansas Speedway, Talladega Superspeedway and Watkins Glen International. Soon, the brand will reveal an exciting promotional experience that fans can engage with at track and across MoneyLion’s social channels. Launched in 2013, MoneyLion is disrupting the traditional banking model by creating new tools for Americans to manage their finances and achieve their dreams. Through their partnership with Team Penske, MoneyLion has brought the most advanced and innovative online and mobile financial tools to race fans. This season, Austin Cindric, who finished eighth in the 2018 NASCAR Xfinity Series championship standings, will pilot the No. 22 MoneyLion Ford Mustang in 18 Xfinity Series races, including the MoneyLion 300. Beyond MoneyLion’s sponsorship of Cindric in 2019, MoneyLion will also serve as a primary sponsor for Joey Logano and Ryan Blaney in the Monster Energy NASCAR Cup Series in select races.